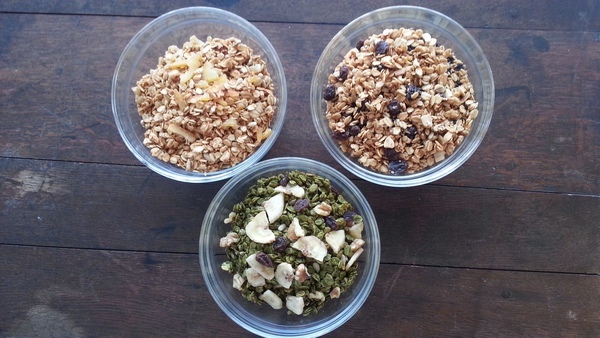 Granola fiend but having trouble getting your fix in Japan? We’ll hook you up with how to make your own – albeit with basics without which it wouldn’t be granola – but also with ingredients that make it distinctly Japanese. ① Add the sake kasu, honey, and salt to a large bowl and mix well to produce a pasty consistency. 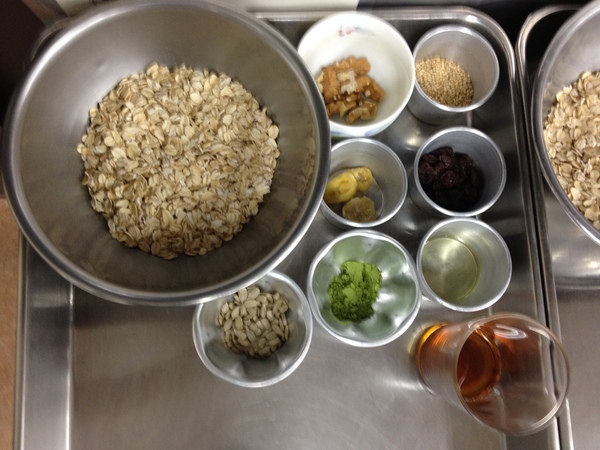 ② Add the oatmeal and mix well. Add the oil and mix well. Add the sesame seeds, sunflower seeds, and shredded coconut, and mix. ③ Transfer the contents of the bowl to a frying pan and place over medium heat until you get a glossy, crumbly texture. Be careful not to burn the granola. ④ Heat an oven to 130℃, spread the granola out on a cookie sheet, and bake for 20-25 minutes. At about the 15 minute mark, stir the granola around to help ensure even baking. The texture should still be a bit soft. ⑤ When the granola is finished baking, transfer it to a sieve and let it cool to room temperature. 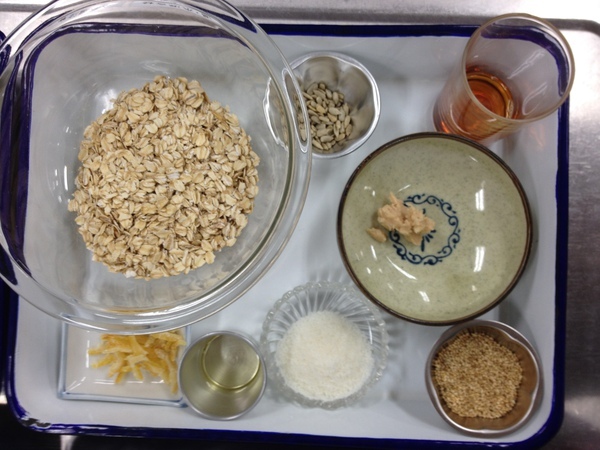 Break up the granola into the desired crumble size, add the yuzu peel, and mix. ① Add the honey, salt, and oatmeal to a large bowl and mix well. Add the matcha and mix well. Add the oil and mix. Roughly chop the walnuts and add them together with the sesame and sunflower seeds. Mix well. ② Heat an oven to 130℃, spread the granola out on a cookie sheet, and bake for 20-25 minutes. At about the 15 minute mark, stir the granola around to help ensure even baking. The texture should still be a bit soft. 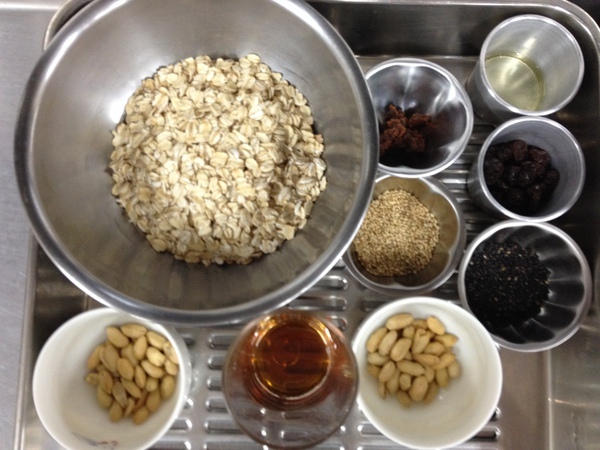 ③ When the granola is finished baking, transfer it to a sieve and let it cool to room temperature. Break up the granola into the desired crumble size. Breakup the dried bananas into the size pieces you want and add them and the raisins to the granola, and mix. * The granola should keep for about a month. Make sure it stays dry. Keeping it in a refrigerator will allow it to last even longer. ① Add the honey and miso to a large bowl and mix well to produce a pasty consistency. Add the oatmeal and mix. Add the oil and mix well. Roughly chop the peanuts and add them together with the white and black sesame seeds. Mix to distribute these evenly throughout. ② Transfer the contents of the bowl to a frying pan and place over medium heat until you get a glossy, crumbly texture. Be careful not to burn the granola. ③ Heat an oven to 130℃, spread the granola out on a cookie sheet, and bake for 20-25 minutes. At about the 15 minute mark, stir the granola around to help ensure even baking. The texture should still be a bit soft. ④ When the granola is finished baking, transfer it to a sieve and let it cool to room temperature. Break up the granola into the desired crumble size, add the raisins, and mix.